Moo Yang Nam Tok is a delicious Thai meat salad made with grilled pork steak that has been thinly slice, then cooked in a sauce made with ground roasted rice, ground dried chillies, fish sauce, lime juice, shallots and mint leaves. 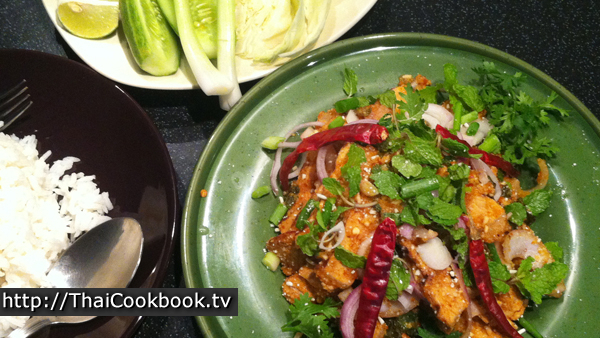 This recipe also includes some green spring onions and cilantro. 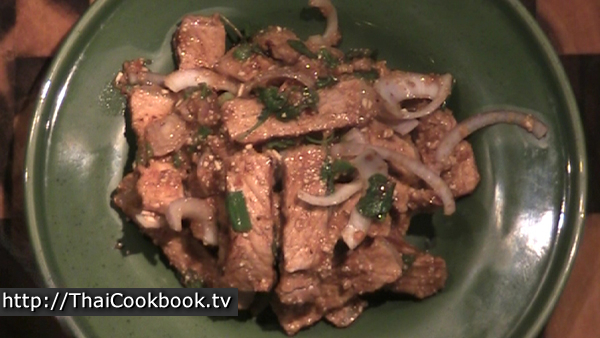 It is traditionally eaten with sticky rice, but can be enjoyed with steamed rice or eaten alone. 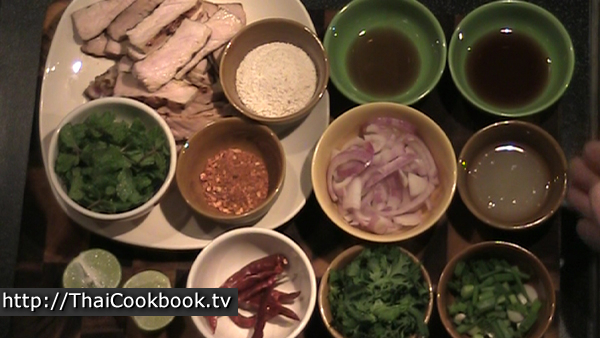 Khun Worawut serves his with a nice big plate of raw cabbage, cucumbers, green beans, mint, and other herbs. What's in our Spicy Pork Steak Salad. 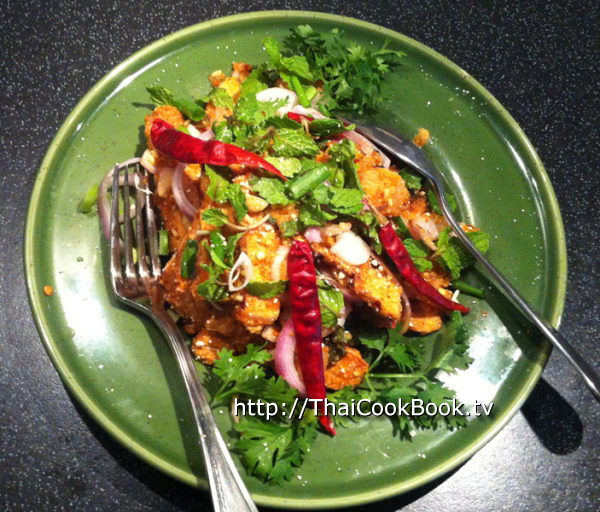 How we make our Spicy Pork Steak Salad. 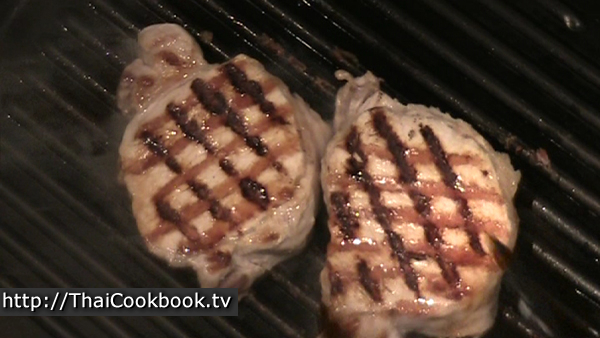 1) Grill 2 small pork loin steaks on a barbeque until medium rare. Allow to cool, then slice into thin strips. 2) Heat about 1/4 cup of water in a small saucepan until boiling, then add the sliced meat, soy sauce, fish sauce, lime juice, and ground chili. Stir it up well, then let it get hot again. 3) Add ground rice, stir it in well, then remove from the heat and allow to cool completely. 4) Add shallots, cilantro, green onion, and mint. Toss everything together well. 5) Serve both servings on a medium-sized salad plate. Arrange some fresh shallot slices, cilantro, green onion, and a healthy portion of mint leaves on top. Sprinkle a pinch of ground rice over the top. Squeeze a few drops of limes juice around the salad. Lay 3 - 4 whole dry chilies on top. Heat a large wok or frying pan over a medium flame. 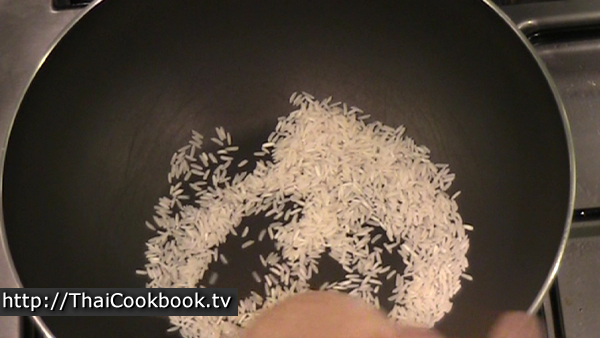 Add 1/4 of uncooked plain long grain rice to the dry wok (no oil, no water). Stir it constantly for about 5 minutes until the rice becomes a nice golden brown color. 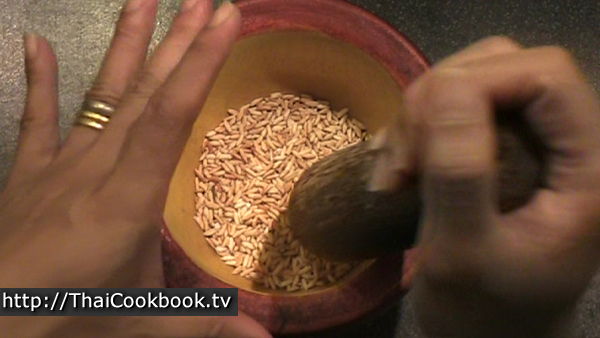 Let the toasted rice cool, then grind it into a rough powder using a mortar and pestle. You can use a food processor, coffee grinder, etc., but be careful not to grind it too fine. It should be chunky. In the same dry clean wok that you used for the rice, toast about 7 or 8 of the sun dried Thai long chilies until you can smell them cooking. Be careful not to burn them. You just heat them up to bring out a lot of oils and flavor. Then, using a mortar and pestle, grind about 2 or 3 of them into a rough powder, saving the others whole to use a garnish. You can use a packaged chili powder, but you want to use a mild to hot chili powder with the whole seeds in, so if you can make your own it will come out better, and you will have some done for the garnish. Grill 2 small pork loin steaks on a barbeque. The traditional recipe calls for the meat to be cooked over wood coals so the fat smokes and burns onto the meat, but I use a grill in the kitchen and it comes out great. Cook the meat until it is rare to medium. Do not overcook the steaks or the meat will be dry. 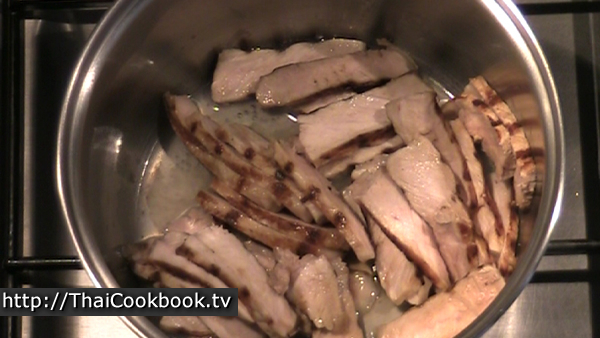 We cook them again in the sauce, so don't worry about under cooking the pork. 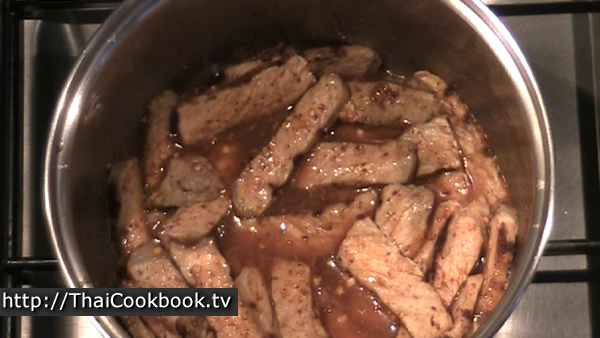 You can also substitute with beef if you prefer it, and using a rare beef with this recipe works very well. Let the steaks cool completely, then slice them into thin strips. Slice the shallots and green onion, and pluck the leaves from your mint and cilantro. Measure and assemble all the ingredients so you can grab them quickly when you start to make the salad. Heat about 1/4 cup of water in a small saucepan until boiling, then add the sliced meat, soy sauce, fish sauce, lime juice, and ground chili. Stir it up well, then let it get hot again. Add the ground rice, stir it in well, then remove from the heat. Let the mixture cool down and thicken. It should be a little watery, like a thick salad dressing. You can add a little more water if you think it needs some. 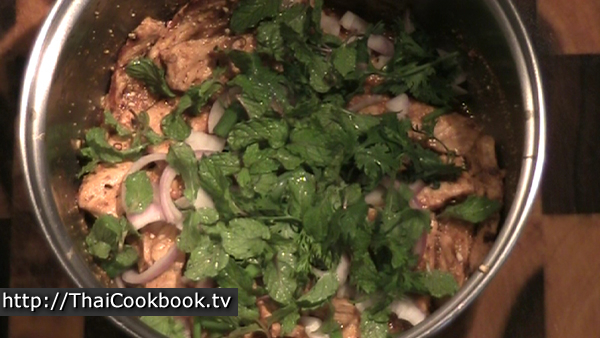 The meat should be almost cold before you add the shallots, cilantro, green onion, and mint. (Save a little of each to add on top of the salad when finished.) Stir it into the meat and dressing just enough to be mixed, but not to much so it softens and turns the herbs to mush. Serve both servings on a medium-sized salad plate. Arrange some fresh shallot slices, cilantro, green onion, and a healthy portion of mint leaves on top. Sprinkle a pinch of ground rice over the top. Squeeze a few drops of limes juice around the salad. 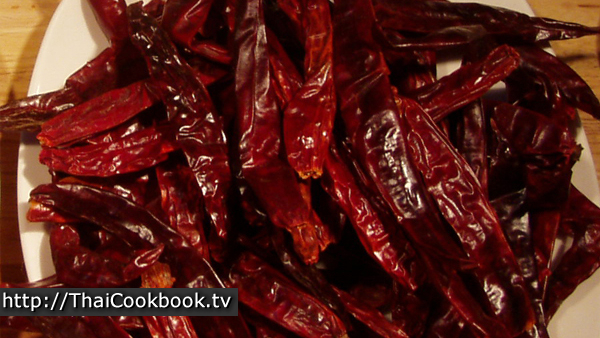 Lay 3 - 4 whole dry chilies on top. 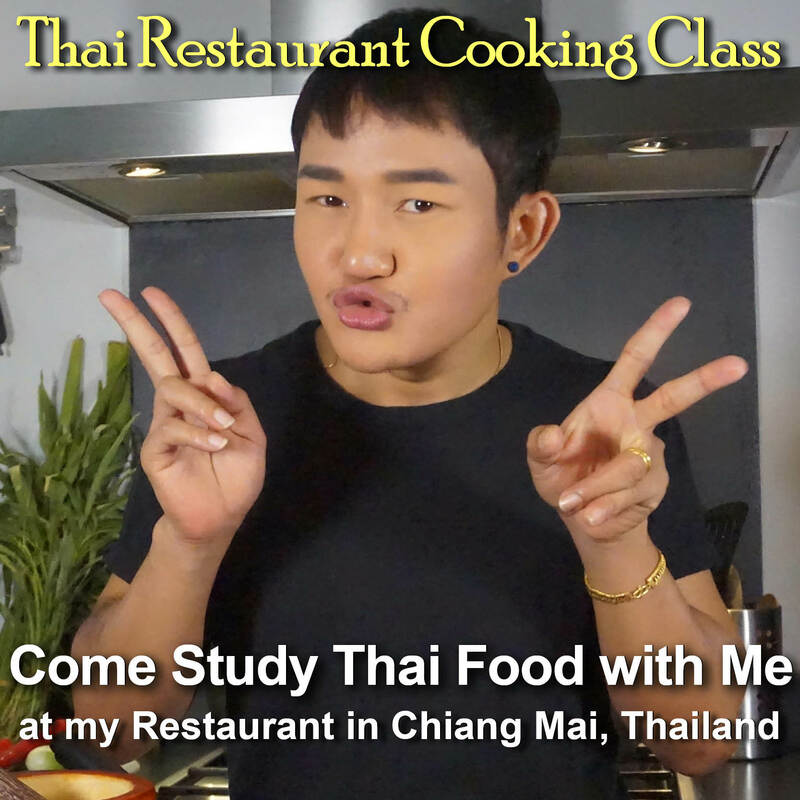 Serve with sticky rice and a plate of fresh raw cabbage, green beans, cucumbers, spring onions, or other crunchy vegetables. 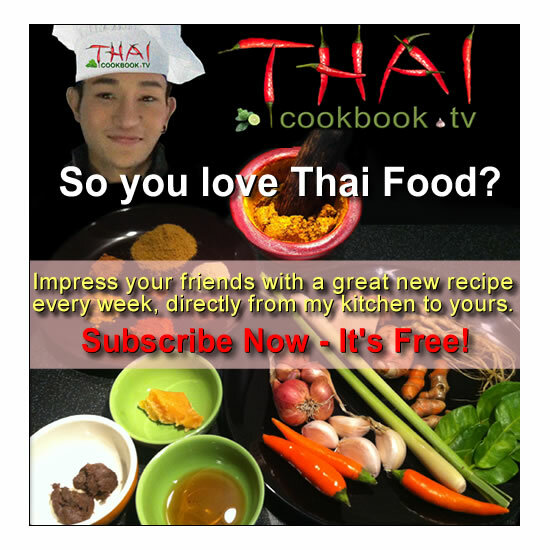 You can serve with Jasmine rice if you prefer.